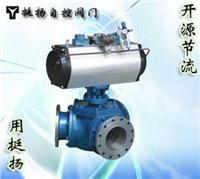 QJ (D / S) R3-type small air-way ball valve is fine by the pneumatic piston actuator and ball valve components. Change the ball core and the relative position of pipes, pipe flow can be achieved for three different combinations of control. The product is compressed air as power source, the control system switches the signal received by reversing solenoid valve, operating valve piping according to requirements of the switch. Three three-way T-orthogonal channel can connect with each other, that divert traffic (mixing) effect, which can also cut off the two tubes connected and another pipeline. L-type links connecting only two mutually orthogonal channel or switch directions, that is, from the distribution function. Three way ball valve according to the role of single and double acting points in two forms. Once the role is characterized by a single power source fails, the ball will be in the state of the control system requirements.